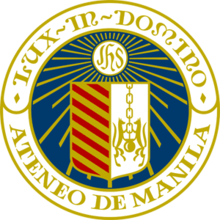 Ateneo de Manila University, commonly known as Ateneo and usually abbreviated as AdMU, is a private research university in the Philippines run by Jesuits. First established in 1859 as a public elementary school known as Escuela Municipal de Manila, it began offering secondary education under the name Ateneo Municipal de Manila in 1865 starting with courses leading to certificates in agriculture, surveying, and business. It later became a private higher education institution during the American occupation when it was given permission to offer bachelor’s degrees in different fields. It dropped the “Municipal” from its name not long after, finally settling to the name it is currently known today. Passing the Ateneo College Entrance Test (ACET) is one of the requirements in seeking admission to the university. Courses in the Philippines is not affiliated with Ateneo de Manila University. For specific questions and other concerns, please get in touch with their official representatives or visit their official website for more information.